For the second year in a row, Warren Beatty and Faye Dunaway arrived on the Oscars stage to present best picture. This time, the results were a little less exciting. "Well, that's how it's supposed to go, I guess," host Jimmy Kimmel deadpanned after the duo announced "The Shape of Water" won the biggest prize of the night – no, really, it did. They double-checked the envelope. This was not a "La La Land"-"Moonlight" situation. Although the show didn't end with an epic mix-up, plenty happened during the nearly four-hour telecast on Sunday night. Here's everything you need to know. 1. Ryan Seacrest’s red carpet experience was . . . awkward. All eyes were on E! 's red carpet after Seacrest's former stylist went public last week with detailed sexual misconduct allegations against the ubiquitous host. Seacrest vehemently denied the accusations, and E! declared he was cleared after their own investigation, so the network stood its ground as Seacrest served as the lead red carpet anchor. But it was certainly a cloud hanging over the coverage, as many on social media noted how many top celebrities stopped to talk to him (not a lot), and the show essentially tried to pretend that sexual harassment – the No. 1 topic in Hollywood these days – didn't exist. Kimmel skewered everything from Hollywood's mistreatment of women ("Here's how clueless Hollywood is about women: We made a movie called 'What Women Want,' and it starred Mel Gibson.") to President Donald Trump, saying that the president "called 'Get Out' the best first three-quarters of a movie this year." And he didn't let the vice president off the hook. "Out of the nine best picture nominees, only two made more than $100 million. That's not the point," Kimmel said. "We don't make films like 'Call Me By Your Name' for money. We make them to upset Mike Pence." 3. Jordan Peele made history. 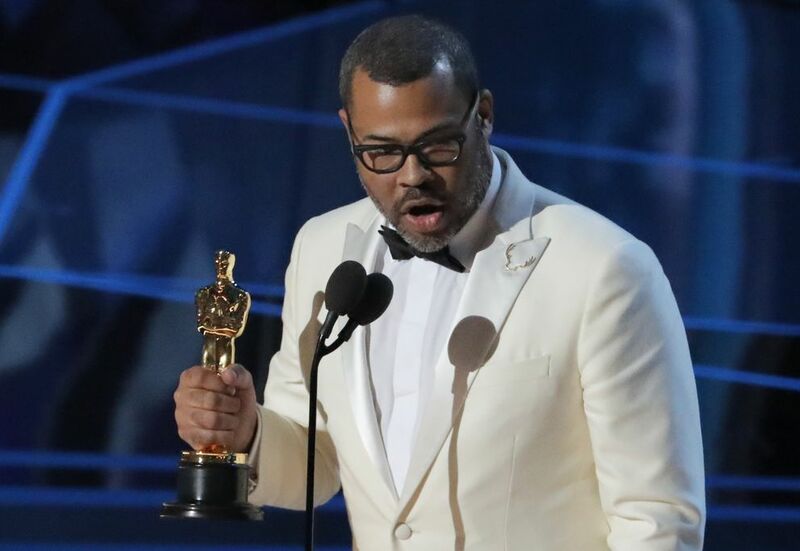 Peele, nominated for best original screenplay, director and picture for his satirical horror film "Get Out," became the first African American to win the original screenplay trophy. "I stopped writing this movie about 20 times because I thought it was impossible. I thought it wasn't going to work," Peele said. "I thought no one would ever make this movie. But I kept coming back to it because I knew if someone let me make this movie, that people would hear it and people would see it." He thanked his parents who "taught me to love, even in the face of hate," and thanked moviegoers who made it a word-of-mouth success, banking $255 million at the box office worldwide. "To everyone who went and saw this movie, everybody who bought a ticket, who told somebody to buy a ticket, thank you. I love you for shouting out at the theater, for shouting out at the screen. Let's keep going." 4) The Jet Ski joke. Early in the show, Kimmel announced that the winner who made the shortest acceptance speech would win a free Jet Ski, presented a la "The Price of Right." Winners made jokes about it ("You guys are going to mess up my Jet Ski," Peele said when applause wouldn't die down) but no one seemed too motivated to claim the prize. "Obviously I'm not going to win the Jet Ski," Gary Oldman said dryly in the middle of his lengthy acceptance speech for best actor. In the end, Mark Bridges, who won best costume design for "Phantom Thread," was the winner with a 36-second speech. 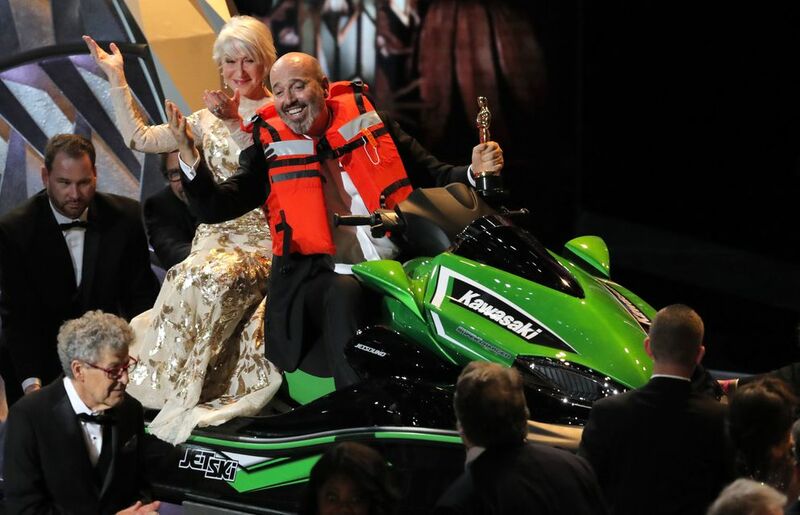 He wore a life jacket as he rode the Jet Ski on stage with, of course, Helen Mirren. 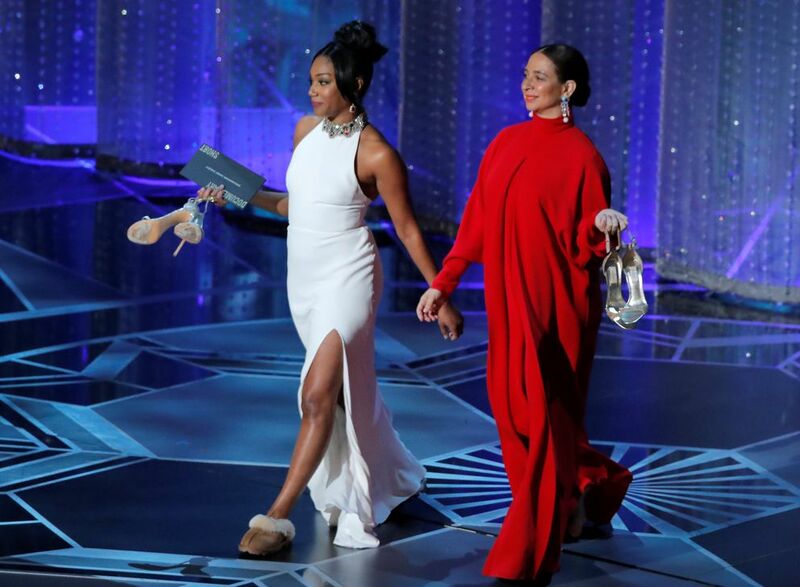 5) Tiffany Haddish and Maya Rudolph made a good case to host next year’s Oscars. The two comedians were a shot of hilarious energy as they presented the short film categories. They strolled on stage with their stilettos in hand, as Haddish wore Ugg slippers, and they bantered about how much their feet hurt. Haddish complained about blisters, but then Rudolph raised her with "girl, my pinkie toe fell off." They also were happy to calm the fears of people who thought the Oscars "are too black now" after years of #OscarsSoWhite. "Don't worry. There are so many more white people to come," Rudolph assured everyone. "So many!" Haddish agreed. "We just came from backstage, and there are tons of them back there." Every other tweet in my timeline is people begging for Tiffany Haddish & Maya Rudolph to host next year and add me to the chorus. 6. 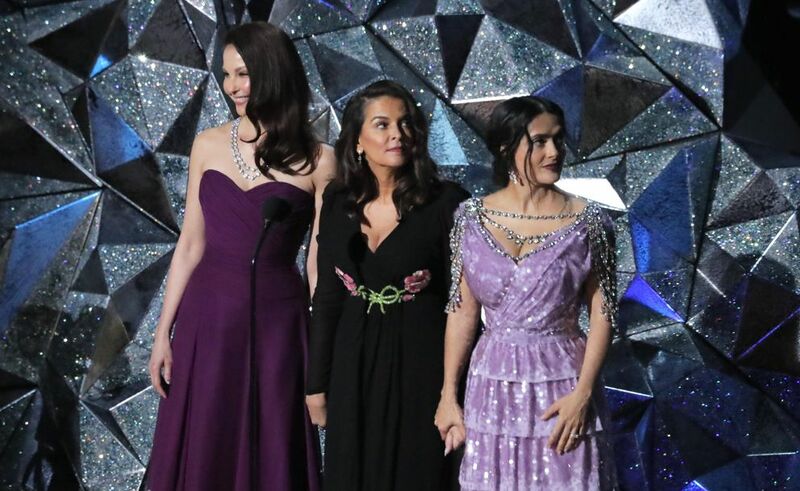 Ashley Judd, Salma Hayek and Annabella Sciorra’s “Me Too” moment. The three actresses, who have all alleged abuse by Harvey Weinstein, stood on stage together as they introduced a video of recent Hollywood trailblazers who are speaking out about inclusion and equality. Sciorra, who has spent years out of the spotlight, got emotional. "It's nice to see you all again," she said. "This year, many spoke their truth and the journey ahead is long, but slowly, a new path has emerged." "The changes we are witnessing are being driven by the powerful sound of new voices," Judd said. "Of different voices, of our voices, joining together in a mighty chorus that is finally saying: time's up." 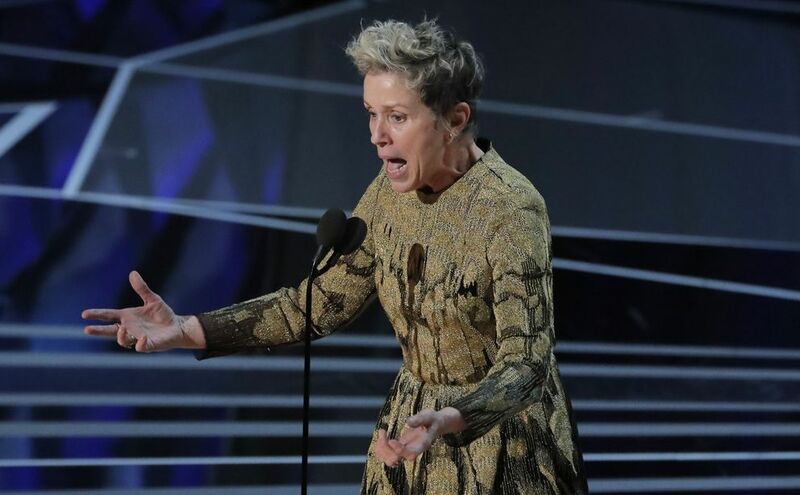 "I've got some things to say," McDormand declared as she picked up her trophy for best actress for her raw, riveting performance in "Three Billboards Outside Ebbing, Missouri." The crowd roared as McDormand urged every female nominee to stand up. "Look around, ladies and gentlemen, because we all have stories to tell and projects we need financed. Don't talk to us about it at the parties," she said. "Invite us into your office in a couple days or you can come to ours, whichever suits you best, and we'll tell you all about them." She ended her speech with two words: "inclusion rider," which sent quite a few viewers racing to Google. This tweet addresses it: "I'm guessing "Inclusion rider" is a reference to the belief by some in Hollywood that there should be requirements in contracts that provide for gender and racial diversity. McDormand is imploring big stars to demand inclusion riders in deals. #oscars"
"I hope Frances McDormand wins an Emmy for the speech she gave at the Oscars, because that was unbelievable," Jimmy Kimmel said. 8. There were no surprises. No, really – there were none. This may have been the most predictable Oscars of all time. All four major acting prizes stayed the same throughout the entire award season: Oldman (actor), McDormand (actress), Sam Rockwell (actor) and Allison Janney (actress). The best picture race was up in the air, but "The Shape of Water" had 13 nominations, so its win made sense. 9. “Lady Bird” was shut out. Again, not a surprise, but still a letdown for some critics who were big fans of the coming-of-age story about a volatile mother-daughter relationship. 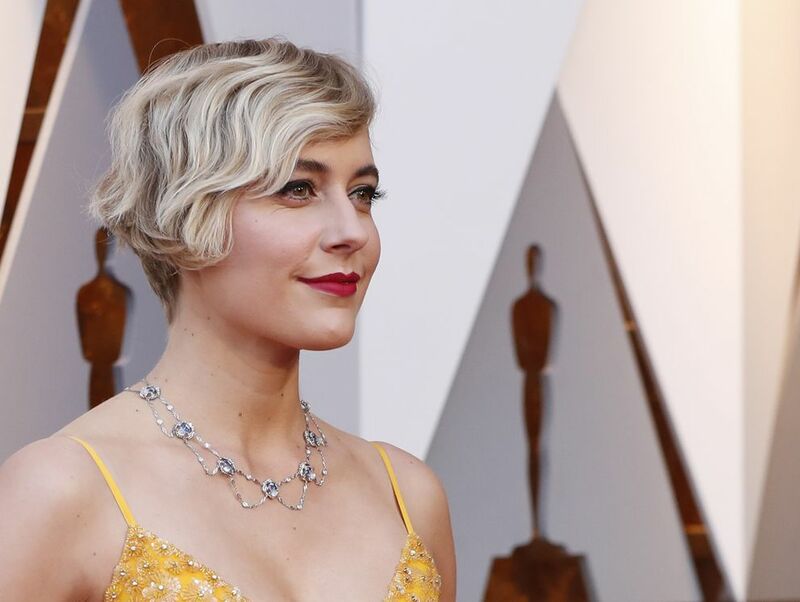 Still, at least Greta Gerwig was nominated for best director, which got called out at the Golden Globes for being an all-male category. "We are the two actors you keep hearing about but whose names you have trouble pronouncing," Nyong'o explained to the crowd, as the duo presented the production design award. "We are also immigrants. I'm from Kenya." "And I am from Pakistan and Iowa, two places that nobody in Hollywood can find on a map," Nanjiani said. "We grew up dreaming of one day working in the movies. Dreams are the foundation of Hollywood, and dreams are the foundation of America," Nyong'o said, as Nanjiani added, "To all the dreamers out there, we stand with you." The reference to DACA wasn't the only political reference of the night. Several people, including Gerwig, emphasized the importance of the truth. "Coco" director Lee Unkrich talked about how "representation matters." After "Icarus" – the documentary about the Russian doping scandal – won best documentary feature, Kimmel cracked, "Well, now at least we know Putin didn't rig this competition, right?" Bryant is an Oscar winner – the NBA star's "Dear Basketball," which he wrote, won best animated short film. Director Glen Keane said the message is "through passion and perseverance that the impossible is possible." "I don't know if it's possible. As basketball players we're really supposed to shut up and dribble," Bryant said, a reference to Fox News host Laura Ingraham's remarks about LeBron James and Kevin Durant criticizing Trump. Anyway, it was complete chaos as the celebs tossed out snacks and shot hot dogs out of cannons to the delighted but very confused movie audience. 13. People were thrilled by older stars. Rita Moreno, 86, got a huge ovation when she appeared wearing the same dress that she wore at the 1962 Academy Awards, when she won an Oscar for best supporting actress in "West Side Story." Eva Marie Saint, 93, who won an Oscar for best supporting actress in "On the Waterfront" in 1954, presented costume design and had a realization on stage: "I'm older than the Academy." That line got a lot of applause. 14. For the fourth time in five years, a Mexican director won the category. 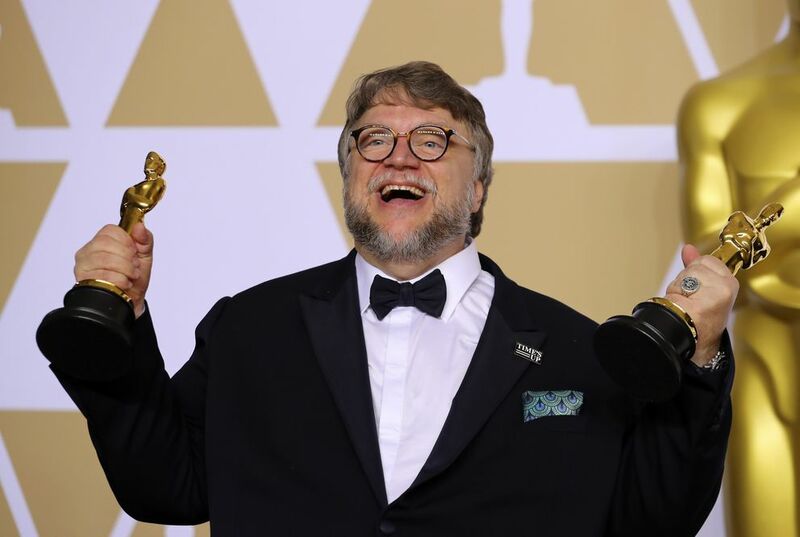 Guillermo del Toro ("The Shape of Water") took home the prize this year; Alejandro G. Iñárritu won in 2014 for "Birdman" and in 2015 for "The Revenant." And in 2013, Alfonso Cuarón won for "Gravity." 15. 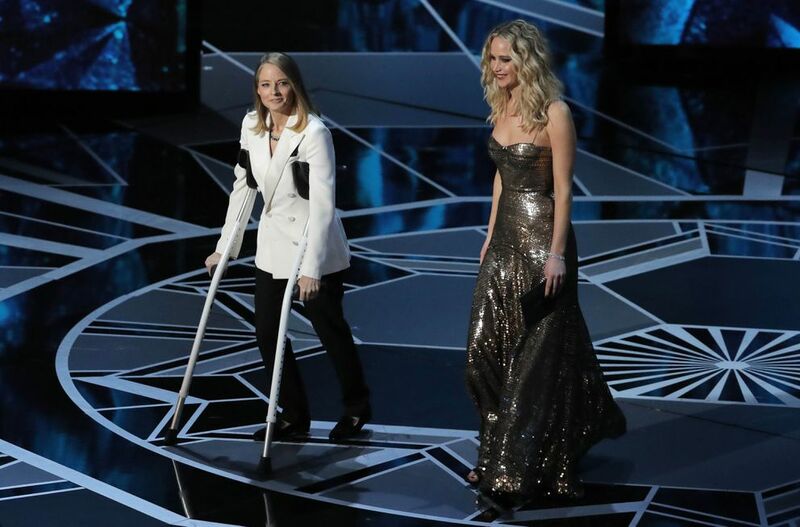 Jennifer Lawrence and Jodie Foster captivated Twitter. The duo presented best actress and did a whole bit about how Meryl Streep is a bully, but social media couldn't focus on anything except the height difference.